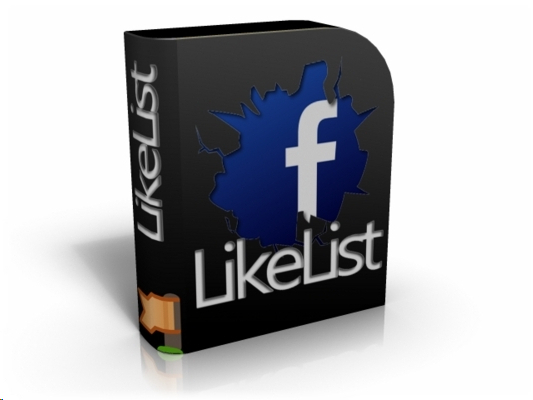 Facebook LikeList v1.2 - PHP Script + Master Resale Rights! SEO on drugs... Facebook LikeList v1.20 can drive THOUSANDS of daily visitors and HUNDREDS of Facebook Pages and give you THOUSANDS of Fans Practically on Autopilot!!! LikeList is the perfect Facebook viral marketing tool keeping the Internet Marketer's needs in mind, as it works as an automatic way to make money on Facebook. This may be the best and easiest FREE way right now to generate a HUGE amount of leads and to multiply your list!!! LikeList is designed to be as simple and easy to use for the users, while being effective and easy to maintain for the site owner. After you set up your site and with literally next to zero promotion, users start using your site, then more users will follow, and that will bring even more, and then EVEN MORE, etc, while you sit and watch your earnings skyrocket! Since what they like shows up in their FB profile and in the news feed on their friends page, this makes the website go viral!!! Now websites created with LikeList will grow on autopilot because the users add their own content! Another huge part of LikeList is that all the entries of your sites are actually FACEBOOK PAGES. This means that if the top 50 entries have been liked by 100,000 people, then you have 50 PAGES WITH 100,000 FANS, that you can send updates to AGAIN AND AGAIN!!! And since the whole website is built around liking things, these numbers are easily achievable! You will have a HUGE userbase in no time! There is an integrated CMS with a full WYSIWYG editor, with which you can easily create pages integrated in the website (that can also be liked and be virally spread over Facebook!). What, even THAT isn't enough for you? Well, there is even an integrated feature to add an e-mail sign up form in the with an export as .csv option. There are also features such as daily trending quotes, an integrated ad manager, full integration with other Facebook functions, and many more (check below)! With LikeList you CAN make money while you sleep! Supports Text, Image, YouTube likes. Practical admin panel providing many useful tools. You can add FULL HTML CUSTOMIZATION on any entry you enter from the admin panel. CMS with a fully functional WYSIWYG editor (so you can easily create additional pages for whatever you want). Show trending, latest, top and random quotes, and the ability to sort these as you like. Optional "Add your e-mail" form. Social activity feed to show latest people that have liked something. Facebook comments on every page. RSS feed with the latest quotes, that can be enabled/disabled and customized. Security from spambots using Google's ReCaptcha technology. Ability to like whole pages. EVERYTHING you read above is easily customizable.